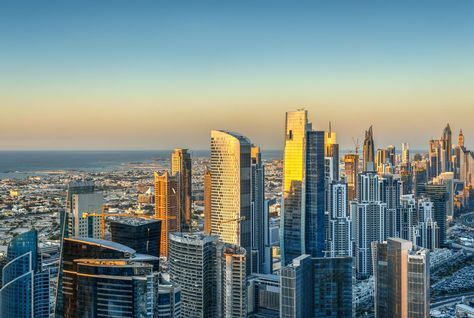 International visitors spend more money in Dubai than anywhere else in the world, according to to the annual MasterCard Global Destinations Cities Index released this week. With more than 15 million international visitors expected this year, Dubai has been ranked as the No. 1 city in the world in terms of international visitor spending, totalling $31.3 billion. “The big surprise this year is Dubai’s jump to the top rank in the world, reporting a total international visitor spending of USD 31.3 billion, a third higher than the second-ranked London, estimated at USD 19.8 billion.5 This also implies a much higher spending per international visitor per visit in Dubai, which is USD 2,050, compared with USD 994 in London,” the report says [PDF]. Dubai is followed by London, New York, Bangkok and Tokyo, respectively. Dubai is also expected to receive the fourth highest number of international overnight visitors in 2016 of any city in the world ranked by the study. It was only beat out by Bangkok, London and Paris. Abu Dhabi ranked third on the ranking of fastest growing destination cities, with a growth rate of 81 percent. Osaka and Chengdu came in first and second respectively. 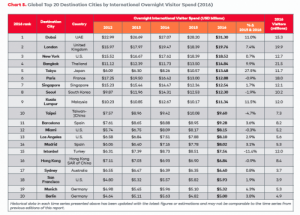 The MasterCard index ranks cities in terms of the number of their total international overnight visitor arrivals and the cross-border spending by these same visitors in the destination cities. It gives visitor and passenger growth forecasts for 2016. They draw on public data to calculate international overnight visitor arrivals and their cross-border spending in each of 132 destination cities. They employ custom-made algorithms, and eliminate the hub effects for destination cities such as Singapore, Dubai, Amsterdam and Frankfurt.